CH Mt. 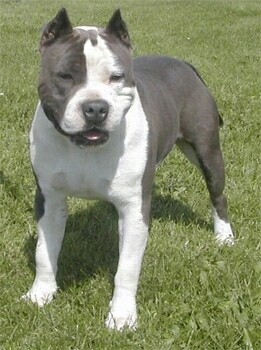 Brier's Eye Of The Storm, TT, OFA, Ataxia Clear American Staffordshire Terrier—"Two-Tone was one of our first bred by AKC Champions from our very first litter. 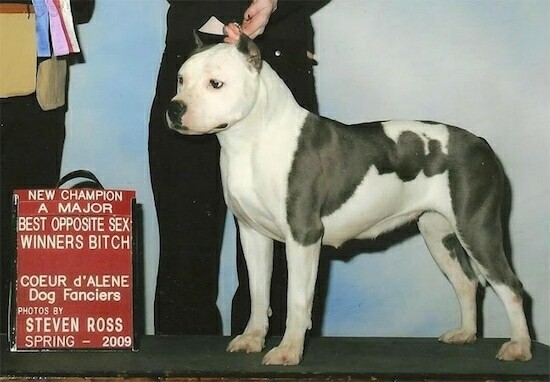 She is an exceptional example of the AmStaff breed - she had brains, beauty, and brawn. She passed her ATTS temperament test (TT) title with flying colors, and all of the proper health testing for the breed, along with easily becoming an AKC conformation champion. Absolutely adored children and had the most stable temperament and rock-solid nerves. She was born in 2002 and has gone over the rainbow bridge sadly, but she will never be forgotten." 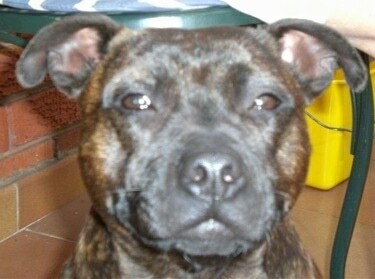 Photo courtesy of MBF AmStaffs. 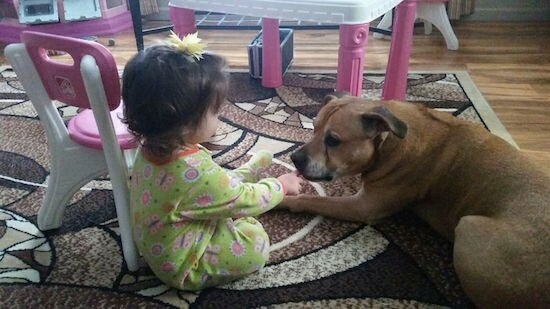 Brynx the American Staffordshire Terrier at 13 years old—"When I set out to get my first dog I wanted to stay away from the stereotypical pit bull breeds, not that I have anything against them, it just seemed everyone was wanting them. 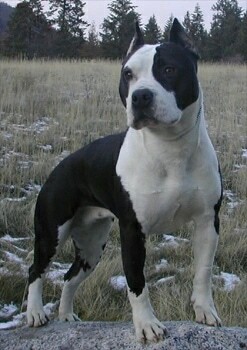 After a couple of months of research the Amstaff was the dog for me. Shortly after I found my pup. I named him Brynx, my own take on home security and oh boy did I get more then I bargained for. Full of energy and a mouth that won't quit. Brynx has been through thick and thin with me and is still by my side. He is a stubborn old man now but shows little signs of slowing down. Since I have gotten him I have married and have had a child of my own and he has never wavered in his loyalty to me. By far one of the best breeds I have had the pleasure of calling MY best friend." 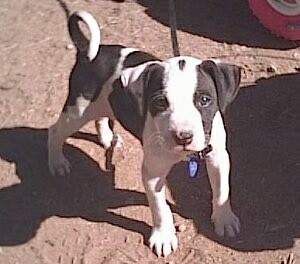 Gracious the American Staffordshire Terrier puppy at 3 months old-"Gracious is so cute. He has champion bloodlines and champion potential." CH Mt. 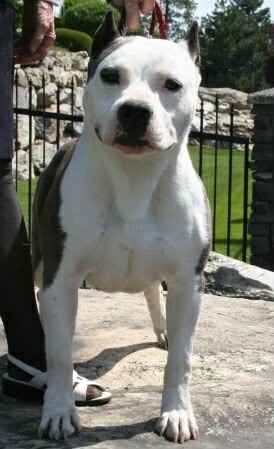 Brier's Sweet Pandemonium, TT, PennHIP, OFA, American Staffordshire Terrier—"Pandora is another lovely example of the AmStaff breed, she excelled in everything from obedience, to agility, therapy work and even conformation (took a Best of Breed win in AKC over top 10 ranked Champions). She even passed her ATTS temperament test proving her stable temperament. 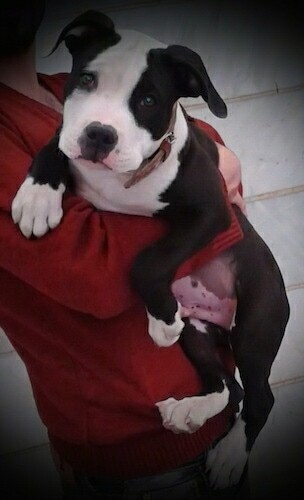 She is a bundle of energy, loves children and adults, like any AmStaff should". 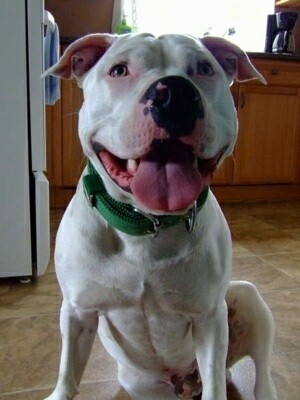 Photo courtesy of MBF AmStaffs. 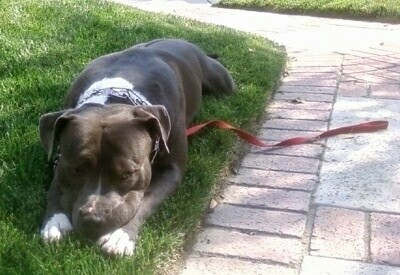 "Cash is a 1-year-old American Staffordshire Terrier. He comes to work with me every day and loves to go around and greet everyone when he arrives. His favorite playmate is a little 7-lb. Shih-Tzu. Since AmStaffs are such a strong breed I follow the Dog Whisperer's methods and work hard every day to make sure I am a good pack leader." "Rodeo changed my life. He was the best ambassador for the breed I'd ever met, living with rescue dogs and staying in a pack of all breeds from Chihuahuas and Yorkies to Great Danes and Pit Bulls. If it wasn't for Cesar Millan’s techniques I know he easily could have been a disaster. My family couldn't believe my mom would let me own this breed, until they all met him on Thanksgiving and while all the other Labradors ran around begging and causing havoc my Rodeo was in a down/stay the whole time. He loved cats and people, but mostly kids. It amazed me the first time a child took his leash; he was calm, gentle and so attentive to what she wanted. The little girl even dragged him up a ladder at a playground and pushed him down the slide. He loved to ham it up and dress up since he went truly everywhere with me. Everyone loved Rodeo and he will always be missed and never replaced, but I will only own bully breeds now. They are truly the family dog if you are the pack leader." 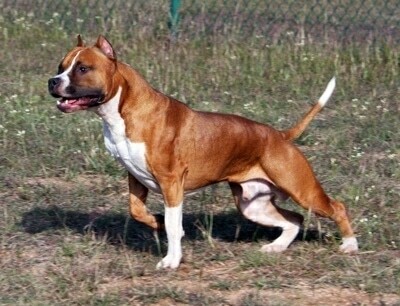 "This is my American Staffordshire Terrier named Fedor. He was the runt of the litter, but is now 1 year old and very healthy. He is white with brown spots (not breed standard but still very handsome) and is the sweetest dog I have ever owned. All he wants to do is play (with anything or anyone). We actually have a hamster as well and we sometimes leave the cage door open (supervised) and they just stay there sniffing and licking each other; I am convinced that Fedor doesn't have an aggressive bone in his body. You can dress him up in the craziest outfits and he doesn't mind... as long as he is with me or in the presence of other people he is happy and content (such a social butterfly)." "Fedor also loves walks. We take him on at least one sometimes two walks a day for about 20-50 min...weather permitting. This is the most important thing for this breed...or any "power breed....” We find that it really mellows him out and it makes both me and Fedor happy to get outside and gives us some bonding time together. He was a bit of a puller at first and we tried some of the techniques we learned from obedience to no avail. I have always watched Cesar Millan on National Geographic and with Fedor’s pulling getting stronger I decided to go out and buy the first season on DVD, so I can try and brush up on my handling skills. One of the episodes had a "puller" on it and Cesar suggested moving the collar up toward the jaw so you have more control over the head and what do you know...IT WORKED...for the owner on the show, as well as for me when I took him for a walk that day (too eager to try it out). Along with being a calm assertive leader I/we can now enjoy our walks together much more without me being worried of him dragging me behind him." "So far Fedor has graduated at the top of two puppy socialization classes and obedience classes and we occasionally take him to a rehab center for injured patients and he does marvelously with them, the older patients LOVE him and his smile and it often makes there day and takes their minds off of why they are really there. It is so important that people understand this breed with all of the BSL laws going on in certain areas. I have had other breeds of dogs (Chihuahua, Lab / Spaniel mix) and Fedor is by far the most affectionate, loving, and loyal dog I have ever had the pleasure of knowing and it's like with any dog, you treat and train them right and they can become a GREAT addition to a family." "This is Mis as in Mischief. She is a 3-year-old brindle Staffy and was dropped into my lap at 10 weeks old by the neighbour [young surfer] who couldn't handle her. Lucky for me and Mis, Cesar Milan had a TV program. He is my hero... Mis loves her everyday walks and runs on the beach and is loving and friendly to all. When some dogs snap and growl at her, she trots up to them and gives them a big kiss. Another trait that cracks everyone up is her snorting and very, very loud snoring." 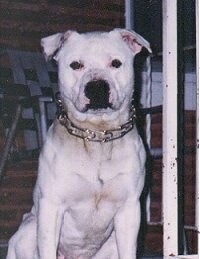 This is 3-year-old Mack a white American Staffy sitting down.